of and prediction of change. Course #1 and are interested in receiving the Math Specialist Certificate, you may enroll and makeup Course #1 before the end of the 2019-2020 academic year. Please fill in this form to apply. Chris is an educator, clinician, and author with over 40 years of teaching experience. She is a Past-President of the American Orff-Schulwerk Association and is presently serving on the AOSA 50th Anniversary Committee. Chris is an active clinician for Orff Level II, III and Master classes, as well as weekend workshops and National & International Conferences. Chris has eighteen publications and is published with Warner Brothers, Sweet Pipes, The Lorenz Corporation, and Beatin’ Path Publications. She is a contributing author for Spotlight on Music, McGraw Macmillan Publishing Company. She had the distinct pleasure of teaching fifth through eighth grade for 31 years at Good Shepherd Episcopal School in Dallas, where she directed four middle school ensembles: Orff, Recorder, D.R.U.M., and a Praise Band. These ensembles have been featured at international and national conferences including the opening session at the 1995 American Orff-Schulwerk Professional Development Conference, P.A.S.I.C. and many TMEA State Conferences. Chris' select groups were chosen to present at TMEA on the grounds of the Alamo Mission in San Antonio, Texas. Chris will present a vibrant 2-day workshop on creativity in the music classroom. Music teachers in all specialities are welcome, as are elementary teachers interested in learning more about using creativity and music in the elementary setting. The Korea International Music Educators Association is an organization dedicated to the advancement of music education in Korea. Our membership includes elementary and general music teachers as well as choir, band and orchestra directors all serving in international schools in Korea. 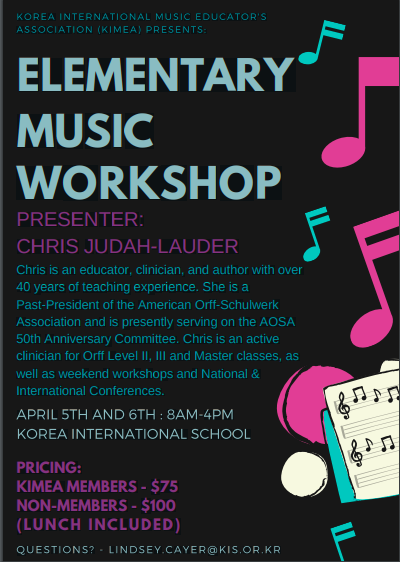 We hope to bring together as many music teachers as possible to share, encourage and advance music teaching in Korea. If you are joining us from outside of Korea, payments can be given at the beginning of the workshop on day 1. Please bring USD (or Korean Won Equivalent) in an envelope marked with your name and school to assist appropriate payment tracking. Send your reservation details (# people, # rooms, etc) to SFS (hannah.kim@seoulforeign.org) if you want the discounted rate. Attendees: Please fill in the form linked in the "more information"
Dear KISCA members, please fill out this form if you are planning to attend our annual KISCA conference at Chadwick International School on April 13, 2019. After we receive your registration form, more details will be sent. The conference fee will be 100,000KW. Thank you and we look forward to seeing you there.